Through the Green Fuse is a portfolio of images that I created as an interpretation and celebration of the design of being, and through them, to enhance my understanding of its nature. In March 1999, I began to feel a need to explore the tools of my medium beyond both their traditional and innovative uses as means to advance self-expression. In contrast to those artists who are turning to technology for additional tools to achieve their own freedoms, I turned to simplicity, mindful craftsmanship and the direct exposure of photographic materials to exercise my own freedom of expression. Without using either camera or lens, my new technique has more in common with Japanese ink brush painting and improvisational jazz than it does with the current practices of photography. Each delivery of light, like every brush stroke or note played, is unrehearsed, and, once released, cannot be undone. The recognition that light in all its manifestations nourishes my life allows me to accept the rigorous demands of this process of imaging as a spiritual exercise. Although the technique has no relationship to those I have used previously, the quality of the creative experience is similar to that of photographing the landscape of my beloved California. The imagery succeeds when I reach a point where my conscious intention dissipates, and, dependent as it is on my hands and my heart, is replaced by a sense of being a conduit for the serendipitous dance I’ve imagined between subject and spirit. This development creates a perilous condition, moving me into a world that is unfamiliar and full of risk yet seems to be a place I must explore for what it might reveal. With this work, I am pursuing something that I cannot define, anticipate or manipulate into existence. In surrendering to the dance of art, I see my life and my work as parts of that design of being which I seek to understand. 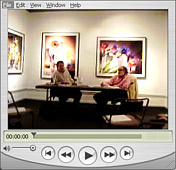 In conjunction with the exhibition of his work at SVAM, Robert Buelteman participated in a number of interactive presentations, including a conversation with Robert McDonald entitled, "The Artist as Visionary" on August 21, 2003. In this conversation, Mr. Buelteman explained the technical processes to his work, but more importantly, gave insights into motivations and approach that one rarely gets from such a talk. SVAM is delighted to be able to bring the artist and community together in ways that help deepen our understanding of the work and its impact on us. If you do not have QuickTime, click the icon to download.